The Cooper Rowan Clinic (CRC) is a free student-run medical clinic that aims to serve the city’s underserved population and reduce healthcare disparities in Camden, NJ. Our clinic provides access to quality care for uninsured, underinsured, and undocumented patients over the age of 16. Medical students from Cooper Medical School of Rowan University and pharmacy students from University of the Sciences in Philadelphia work together in teams to provide care to patients at the CRC, under close supervision of at least one licensed faculty physician and pharmacist who are on site during clinic hours. At our practice, students assume supervised responsibility for the primary care management of their patients. It is the goal of the CRC to deliver a continuum of patient-centered care by offering a single care provider who is aware of all of his/her patient’s medical issues. Our students act as health advocates who will focus on reducing health barriers for our patients by locating social and medical resources, as well as accompanying patients to their various medical appointments across multiple disciplines. 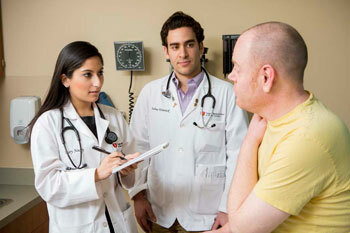 CRC offers both the primary care and medical home that you deserve. The Cooper Rowan Clinic operates on a limited schedule during the summer months. Care for chronic conditions such as diabetes, high blood pressure and cholesterol; physicals; sick visits; referrals for testing and specialty care; medications for common conditions. For more information or to schedule an appointment, please call (856) 628-5777. We will respond to your request during our business hours.